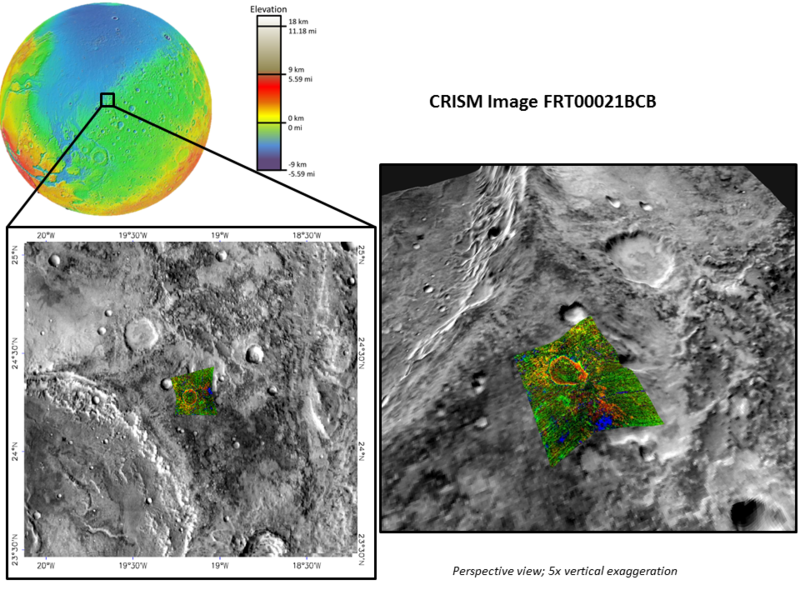 CRISM image 21BCB covers a region on the boundary of Chryse Planita, between Mawrth Vallis and Oyama crater. Chryse Planitia is a smooth circular 1600 km diameter plain that was a landing site for the U.S Viking 1 (landed July 20, 1976), and the Mars Pathfinder (landed July 4, 1997). Mawrth Vallis is an ancient Mars river channel (~15km wide) located along the crustal dichotomy boundary that exposes abundant light-toned layers of clay-rich rocks. It has been theorized that Chryse was once the site of a large body of water because many of large outflow channels and ancient river valleys, such as Mawrth Vallis, end when they reach the plain. The image reveals detections iron-magnesium phyllosilicates (red), aluminum phyllosilicate (bright green), and alunite (blue), a type of sulfate, in the rim and ejecta of a ~9 km diameter impact crater. While alunite forms when volcanic rocks are exposed to acidic fluids, phyllosilicates are clay and clay-like minerals formed during the interaction between rock and liquid water. While iron-magnesium phyllosilicate is formed by reaction of igneous basaltic rocks with water, the formation of aluminum phyllosilicates implies a more sustained interaction and/or the involvement of a heat source. These clays may have been deposited during massive flooding events or in a shallow lake environment, but also could have been caused by in-place weathering of preexisting layered material like volcanic ash or crater ejecta. Clay minerals are good at preserving evidence of past life and habitable conditions, and so this area has been intensely studied as a candidate landing site for several robotic missions.